When the first official trailer for the modern-day movie version of The A-Team appeared online recently, the reaction from fans was mixed. Some people (including many of Screen Rant's readers) thought it looked like a fun, entertaining summer film with a great cast - while others thought it was a disappointment, that the CGI was out of place and that Quinton Jackson as the new B.A. Baracus couldn't act worth a squat (he comes from the world of UFC not Shakespearean theater, after all). We got our first proper look at The A-Team with a first official image back in October of last year (see header above). 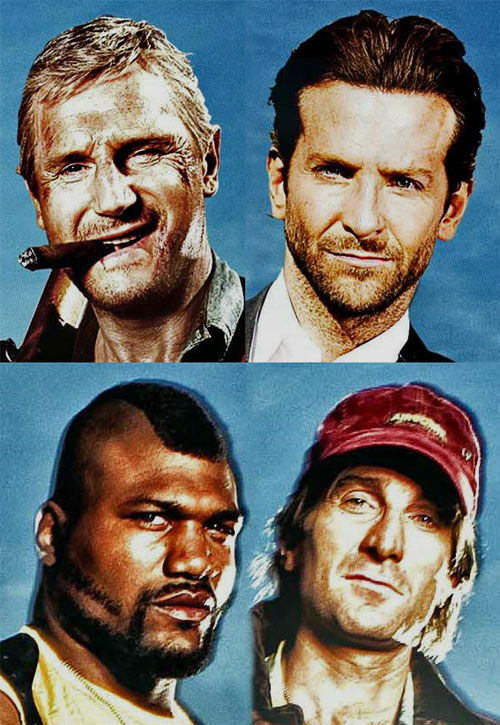 It showcased Liam Neeson as Hannibal, Bradley Cooper as Face, Sharlto Copley's Murdock and Jackson as B.A. Baracus. Now we have a second official look at the The A-Team, this time in the midst of an action scene with guns-in-hand and stuff blowing up behind them (as it should be!). As far as I'm concerned, the pic looks great and only adds to my thoughts that this is going to be one helluva good time at the movie theater this summer. On top of that new image, The LA Times also has some info the film provided by director Joe Carnahan (Narc, Smokin' Aces). In the interview (which was conducted on the set of the movie last month in Vancouver), Carnahan talks about the fact that this particular version of The A-Team isn't exactly what people might remember from the original 1980's TV show. Carnahan describes his take as being more like Chris Nolan's revitalization of the Batman series, as opposed to what movies like Starsky & Hutch and Land of the Lost did recreating their respective TV source material. He says he's not interested in making, "the easy, breezy Cover Girl version of ‘The A-Team.’” He also reiterated that this new team isn't a quartet of Vietnam war veterans, but rather a team of covert operatives who ran missions in the most recent Iraq war and, "got hung out to dry for crimes they didn't commit." I'm not a die hard A-Team fan so that doesn't really bother me - but I know die hards are out there, so air your grievances in the comment section below. If you're like me, tell us why you don't care about sticking to the original show and why you just want to see a fun action movie with a great cast. Or maybe you're somewhere in between and waiting to see more before you decide which side of this you're on? The A-Team is scheduled to hit U.S. theaters on June 11th, 2010. Those in the UK will have to wait over a month longer as it hits theaters across the pond on July 30th.